Dr Miriam Gill and Dr Ellie Pridgeon will be speaking at the South Newington Wall Painting Symposium in June 2012. 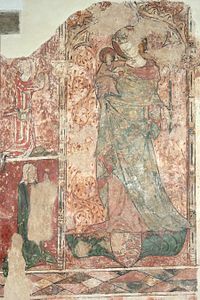 The papers will focus on the unique features of the fourteenth-century north-aisle paintings, particularly pigment, style and iconography. The web-link for the event will be available here soon. The Virgin and Child with Donor Figures. Paintings in the north aisle include the Martyrdom of Becket, the Martyrdom of Thomas of Lancaster, St Michael, the Virgin and Child, and St Margaret of Antioch. Painted armorial bearings include those of Giffard and Morteyn (Mortayne). The donor figures in the Virgin and Child image (depicted here) are commonly identified as Thomas Giffard and Margaret Mortayne, who were probably responsible for commissioning the paintings.